1. Read A Book: In November I finished Rising Strong by Brene Brown. It was a good read but not (IMHO) as strong as her other books. I'd highly recommend The Gifts of Imperfection if you haven't read Brene Brown yet but are thinking about it! 2. Try A New Recipe: In November I tried a recipe for crock pot Sesame Chicken. It was a complete and utter failure, well unless you really love the taste of soy sauce, which I don't. I still need to find some good crock pot recipes that aren't roast or stew. 3. Declutter: If the van load of STUFF I took to Care & Share yesterday is any indication, November was a banner month for decluttering. Two entire Rubbermaid totes of former "guest" bedding plus a lot of miscellaneous Twin XL college bedding, a chunk of my winter wardrobe, a bunch of Jay's old computer textbooks... so glad to have that stuff out of the house! 4. Complete An Unfinished Project: My UFO was the long-procrastinated clean out of our basement storage room which was the source of a lot of the items being decluttered in November..
6. 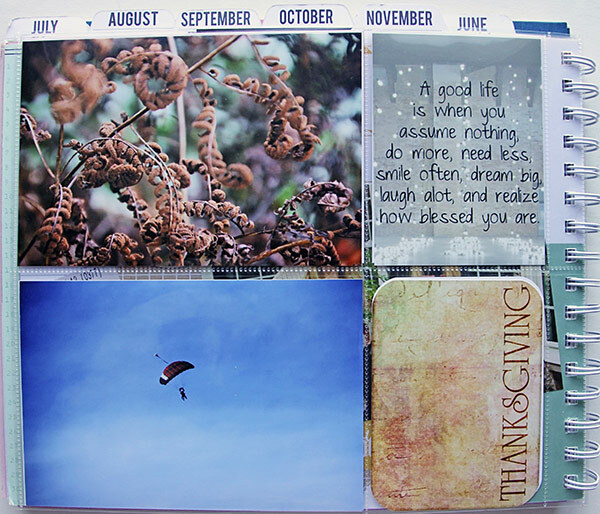 Scrapbooking - My Favorite Five - I signed up for LOAD216, so I know I'll be scrapbooking in January and February. 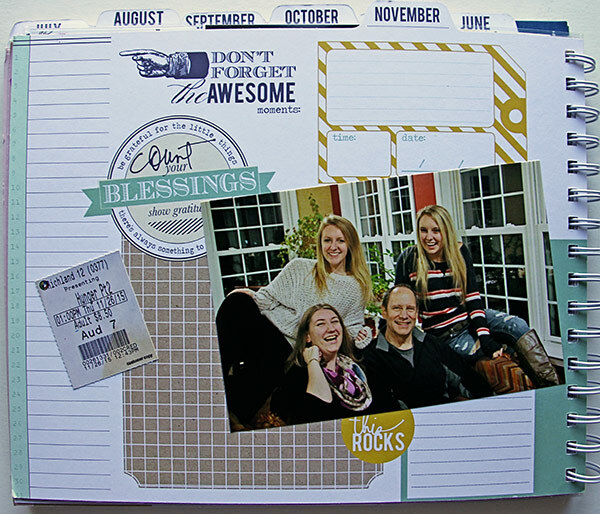 Not even going to try to do anything beyond my December Reflections to finish out 2015. 7. Photography - November was a lot better. Photos of the changing leaves and fall decor actually happened, as well as Jay's annual birthday photo! 8. Art Journaling - um, not so much. 9. On the Wellness front - I completed physical therapy and graduated myself right after Thanksgiving. I'm still hanging in with the Intro to Fitness class, trying my best to keep up with the sadist instructor. I'll be starting with a personal trainer that I like and trust in late January. So I'm still trying. Two steps forward, one step (or two or three) back. That's the way it goes. 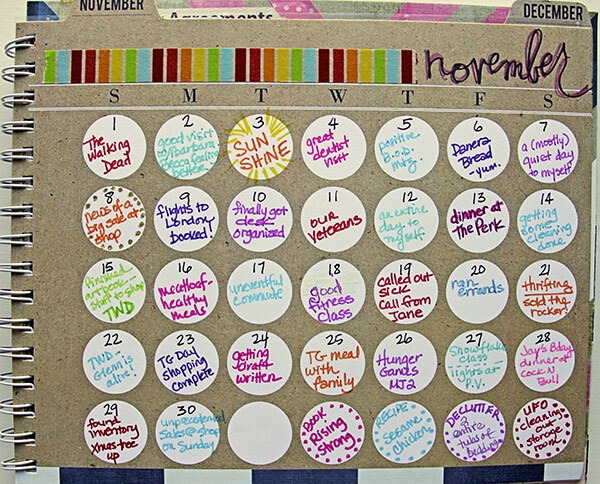 If you hand't done anything else in November, the decluttering would d have been enough! What an accomplishment. There's nothing that makes me feel as great as a good clean-out---especially going in to the New Year! I love the birthday photo! I tried a slow cooker chicken recipe with soy sauce recently too..and it was pretty awful! Not helped by the fact I used very dark soy, so everything turned black.. I've got some good slow cooker recipes. I'll send you a list later this week, and if any interest you, I'll send them on. That is one fantastic birthday photo! I hoped you've framed it. I agree with you on Raising Strong, I'm not finished with it but I'm struggling to finish it. I loved her other books but this one is not grabbing me. Beautiful family photo! Have a Happy Holiday! Congrats on a huge decluttering job completed! Glad to hear you're done with physical therapy. I'm getting started back with the trainer in January, too. Worked out with her a few times in November & looking forward to a new start in January! My favorite crock pot recipes are meatballs & gravy and Mexican chowder. Well done on the de cluttering front! Lovely family photo. Pleased to hear the physio has finished, plenty of time for extra exercise in the new year! I agree with you that it is difficult to find a good crock pot recipe that is not roast or stew. I found this pork chops Stroganoff, and the family really liked it. The sauce was a bit thin but I think that was completely my fault. Here is the link: http://bakeatmidnite.com/slow-cooker-pork-chop-stroganoff/. 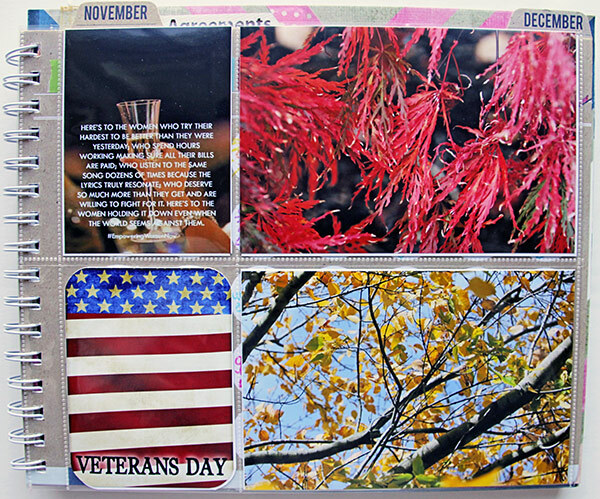 The leaf photo is beautiful - I love to take pictures of leaves especially when they are so colorful. Warm orange and red shades are my favorites. Princess has been finding different recipes for the crockpot - although she's making them in the Instant Pot. I'm enjoying use that as I can sauté things before the slow cooker bit.